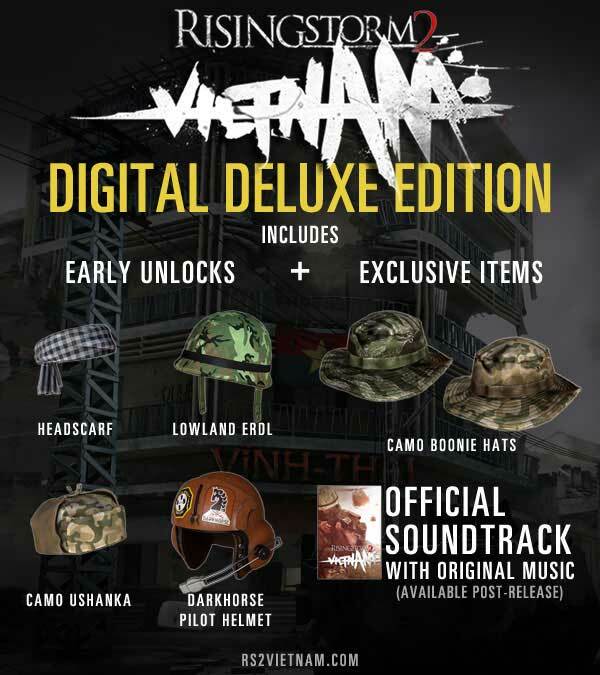 Download game Rising Storm 2 Vietnam Digital Deluxe Edtion right now! Rising Storm 2: Vietnam is the sequel to PC Gamer’s 2013 ‘Multiplayer Game of the Year’, published by Tripwire Interactive and developed by Antimatter Games, the same team that created the award-winning innovative asymmetric gameplay of the original Rising Storm. For the first time, the authentic gunplay and visceral first-person action of the Red Orchestra series is coming to an era of automatic rifles, man-portable grenade launchers and more modern weapons systems. Rising Storm 2: Vietnam casts players into a brutal, authentic recreation of the Vietnam War. Large-Scale 64 Player Gameplay – Rising Storm 2: Vietnam offers intense tactical action for up to 64 players in battles between the US forces and the Vietnamese, with each force having their own unique abilities and tactical advantages such as Napalm Strikes, Artillery Barrages, surface-to-air missile strikes, traps, ambushes and more. Flyable Helicopters - Players on the US team will be able to pilot 3 different helicopters - the UH-1H "Huey" transport, the OH-6 "Loach" light recon and the powerful AH-1G "Cobra" attack helicopter. 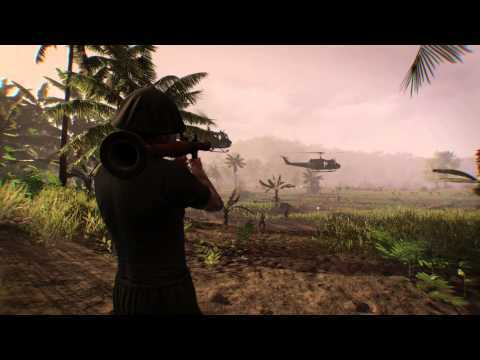 Conventional vs. Guerilla Forces – Play as both the United States Military and Vietnamese resistance fighters. Rising Storm 2: Vietnam allows players to control either the U.S. Army and Marines Corps or the militarized and guerrilla forces of North Vietnam - the NVA and the Viet Cong. New Game Types – Game types include Red Orchestra's classic territory control mode and new smaller modes and maps designed for 16 or less players. These new smaller maps are designed to be a more competitive, squad based experience that reflect the 'low-level' conflicts that Vietnam is famous for. Realistic, Large, Open Levels – Each map faithfully recreates the conflict of the Vietnam experience and aims to pull players directly into the war with its extreme authenticity to real life. Maps will include the famous jungles of Vietnam, but will also cover battles that occurred in cities, on rolling hills, in US Firebases, Rice Fields, Plantations and many more authentic locations. In keeping with the Vietnam setting, they will provide plenty of opportunity for jungle ambushes and flanking attacks. Vietnam- Era Authentic Weapons – A variety of authentic period weapons available including the M16, M14, M60, M79 and M3 Grease Gun for the Americans; and the Type 56 Assault Rifle (a Chinese copy of the famous AK-47), RPG-7, MAT-49, SKS Carbine and many, many more for the Vietcong. Weapons also have a wide range of functionality with in-game implications, including adjustable stocks, attachable bayonets, and a new and advanced recoil system which builds on the already phenomenal weapon handling that the Red Orchestra series is famous for. Squads and Command – Drastically enhanced squad and communication tools to help you group up and work with your friends and team-mates. No Class Ranks / Weapon Upgrades / Unlocks – Rising Storm 2: Vietnam's focus will be player skill and balance. We won't be locking content like weapon upgrades, improved player characteristics or new armaments behind a rank or experience system. We want to put the tools to succeed in the hands of every player. Rising Storm© 2013-16 by Tripwire Interactive. Rising Storm is a registered trademark of Tripwire Interactive in the USA and other countries. All rights reserved.